American DJ Lighting COB Cannon DJParts - All Variety of Parts that DJ Needs. The ADJ Lightning COB Cannon produces a large wash of white light from high output, advanced COB (Chip On Board) cool white LEDs–COB LED technology allowing for a powerful LED engine to be placed in a small amount of space. 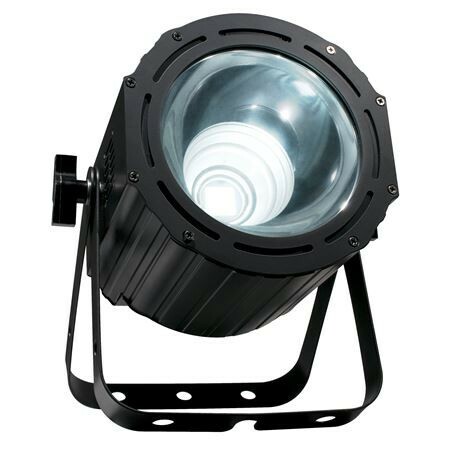 Super Bright, high output, white strobe cannon Great for performance stages, theatrical productions and special effects productions –requires almost no maintenance – low heat, low power consumption Advanced COB Technology (Chip On Board) produces powerful, high output white light 3 Operation modes: Sound Active, Manual, & DMX 3 DMX Operation modes: 1, 2 & 3 channel 4-button digital display Flicker Free operation (No flickering on camera) 5 selectable Dim Curves (Standard, Stage, TV, Architectural & Theatre) LED pulse and strobe effect Electronic Dimming: 0 - 100% Beam angle: 33 degrees Dual yoke allows fixture to be hung or set on the ground DMX Linkable: 3-pin XLR data connectors Power Linkable: PowerCon connectors (Up to 3 UV COB Cannon’s at 120V, 5 UV COB Cannon’s at 220V fixtures) Long Life LEDs (Rated at approximately 25,000 hrs.) Power Draw: 120W total (All LED's at Full) Light Source: 60 x 1.5-Watt COB Cool White LEDs (81-Watts total) Color Temperature: 8,000K Multi-voltage Operation: Auto switching, AC 100V - 240V/50Hz -60Hz This professional lighting fixture is designed for washing performance stages, theatrical productions and special effects productions. It requires very little maintenance or service due to its sold state electronics. The Lightning COB Cannon has 3 operational modes (sound active, manual or DMX), has 3 DMX operational modes, 5 selectable dim curves, a 4-Button DMX Display and is flicker free for film and television. This fixture is DMX linkable via 3-pin DMX, and is power linkable via PowerCon connections. The light source is an 80-Watt COB cluster of 60 x 1.5-Watt Cool White (8,000K) LEDs.